← Benjamin Britten at 100 – time for a new appraisal? There is something about the wooden texture, shining metal and the styling of traditional musical instruments that is very appealing. Although most of their designs are centuries old, there is a lot of grace and beauty in the way classical instruments are constructed. 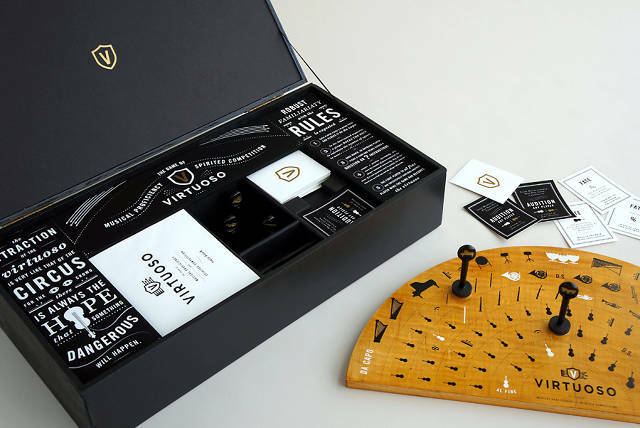 Virtuoso is a board game that successfully captures that unique classic design. The playing board is wooden and shaped as a classical orchestra’s stage. All of the game design down to the dice is inspired by classical music and instruments. It’s designer, Caleb Heisey describes it on his website: “Virtuoso is a music theory board game. Players compete against each other by successfully answering trivia questions about music history, composition, listening comprehension, and theory. Not for the faint of heart, Virtuoso is a competitive, yet educational game geared for high school and college musicians to expand their knowledge and show off their mad skills.” When not used for playing, it will serve nicely as a collector’s item thanks to its beautiful design. Heisey is a Philadelphia based print designer and illustrator. He studies for his MFA (Master of Fine Arts) degree in Graphic Design at the Tyler School of Art. Although Virtuoso gets a lot of interest, the game is not for sale yet and does not even has a price tag. Heisey is looking for a publisher to produce the game and to distribute it. If you are interested he will be glad to hear from you via his website. After talking to him drop me a line, I’ll be glad to own one!